There aren’t many places in the world where you can party all night in a cave. Cala'n Porter on Menorca’s sunny south coast is one such place. By day the legendary Cave of Xoroi is a bar. At night the cave transforms into a club and stays open well into the early hours. A holiday to Cala'n Porter is all about having a good time. Being the largest resort on the island and close to the capital Mahon, the town perches on cliffs and enjoys fabulous views over the beach and bay. Located only a short distance from the airport which means you can spend more time relaxing, sunbathing, swimming and partying. 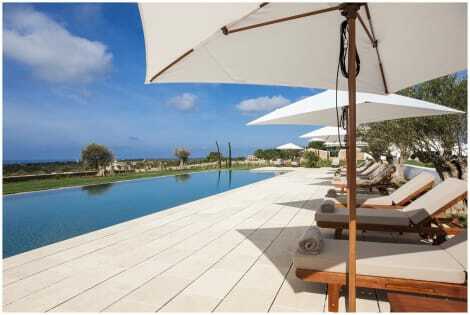 Cala'n Porter is a lively resort by Menorcan standards. A party atmosphere can be found in the town’s clubs and bars, but it is tame compared to its Balearic holiday destination of Ibiza and Majorca. The real selling point of a holiday to Cala'n Porter is its large sandy beach sheltered by lush green cliffs making it heaven for sun worshippers. Be warned it’s a steep climb from the beach up nearly 200 steps to the town above. Families with very young children or anyone unable to face the climb on a hot day can take the small train that runs from the beach up the winding road to the town. Not only are there stunning views over the bay out to the Mediterranean but on clear days, if you look inland, Menorca’s highest point, Mont Toro can be seen. Drag yourself away from the beach and visit Mount Toro’s spiritual centre, the Sanctuary of the Mare de Decídel Toro, and home to nuns. Menorca’s capital Mahon, with one of the world’s largest natural harbours, is worth taking a trip to. Relax over tapas and wine at one of the harbour side restaurants before hitting the shops and discovering quirky boutiques amongst the big name stores. Take the time to stroll through the centre of Mahon and admire the Georgian buildings and soak up the atmosphere of a very special city. Find other places to visit whilst on holiday in Menorca. If you want a great deal to a lively resort then book your holiday to Cala'n Porter with lastminute.com today. 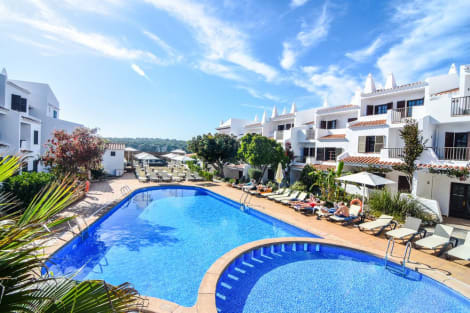 With plenty of sunshine, a picture perfect beach and entertainment in bucket loads, Cala'n Porter offers everyone, young or old, families or couples, a slice of an authentic Spain holiday.